An alien ship arrives in National City demanding the release of Mon-EL. After Mon-El agrees for the city’s safety, Kara sneaks with him and finds the ship run by King Lar-Gand and Queen Rhea of Daxam, Mon-El’s parents. From the revelation that Mon-El is the prince, he is forced to admit to Kara how his escape only came from a guard killing a Kryptonian ambassador and stealing his pod. 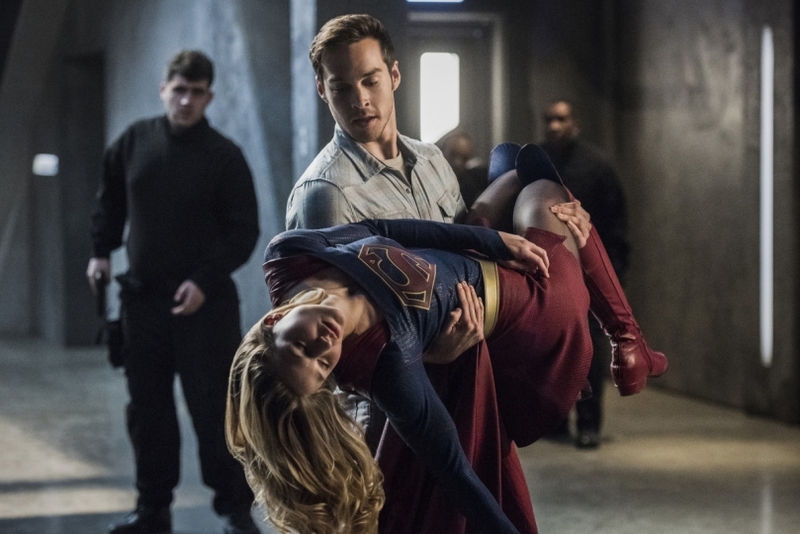 Furious at Mon-El’s deception, Kara leaves him with his parents, but Rhea later contacts Kara to help her convince Mon-El to return to a restored Daxam with them. Meanwhile, Winn is framed for stealing an art piece after Lyra tricks him on one of their dates. With Maggie and James’s help, Winn soon discovers Lyra to be an art thief and smuggler for an alien gang lead by one named Mandrax. However, Lyra reveals to Winn that her crimes are only to help protect her brother. Although Mon-El attempts to reconcile with Kara, Kara refuses to accept his apology. Instead, she advises him to meet up with his parents since she herself would never have the chance to see her family and her world again. In the meantime, Winn and Lyra confront Mandrax and his gang with the help of Guardian and Maggie with the NCPD. Although Lyra betrayed him, Winn offers his forgiveness, and the two reconcile. Despite meeting with his parents, Mon-El refuses to leave Earth and rebukes his parents for their rule on Daxam. Returning to the DEO, Kara plans to visit Central City to get away from her thoughts. However, she is then struck down by a new DEO prisoner who steals Winn’s new device and escapes to Earth-1. In a new world, Kara finds herself the new act at a music club. Mon-El’s father is named Lar-Gand, the real name of Mon-El from the comics. 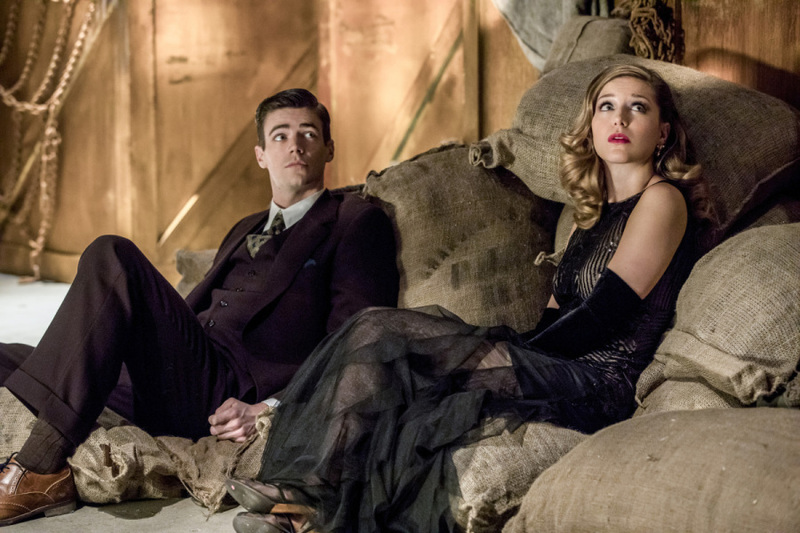 Kara references her love of musicals, hinting at her part in The Flash’s musical episode. In STAR Labs, J’onn and Mon-El appear with an unconscious Kara warning about the Music Meister in their world. The Music Meister soon shows up and incapacitates Barry, transporting him into the same world as Kara. Finding each other, they soon discover they are without their powers in a world with doppelgangers of Malcolm Merlyn, Cisco, Winn, and some of their other friends. The Music Meister then warns them that they are in a musical world that can only be escaped by finishing the story. As they continue the songs, Barry is knocked out by Martin Stein, who appears as an opposing mobster to Merlyn. Joe, a fellow mobster and romantic partner of Stein’s, demands Barry help him find his daughter Iris who has been seen with Mon-El’s doppelganger, the son of Merlyn’s character. Meanwhile, Wally, J’onn, and Cisco attempt to stop the Music Meister from wreaking havoc in Central City after he apparently displays both Kara and Barry’s powers. Despite Wally’s initial apprehensive back in the field, the three successfully subdue the Music Meister and take him to STAR Labs. Meanwhile, Barry and Kara return Iris to her father, but the reveal of her secret relationship begins a turf war between the mobsters. In the midst of the fighting, Barry and Kara are shot, spiking their vitals in the real world. Cisco successfully vibes Iris and Mon-El into the musical world just as Barry and Kara near death. The two then kiss their respective partners which brings the musical to an end. The Music Meister escapes his captivity, revealing his plan was only to teach Barry and Kara a lesson on love before disappearing. Back at home, Barry puts his feelings into a song to express himself to Iris, ending with another proposal that she accepts. Various musicals are referenced including The Wizard of Oz, Singin’ in the Rain, The Fantasticks, and West Side Story. Mon-El is named Tommy Moran in the musical world, after Malcolm Merlyn’s real son Tommy. Similarly, Iris is named Millie after Stein’s real daughter Lily. Legends of Tomorrow "Fellowship of the Spear"
The Legends plan to take on the Legion and retrieve the remaining pieces of the Spear from their location in The Vanishing Point. While they regain the pieces and reform the Spear, they learn that they can only destroy it with the blood of Christ. Fortunately, Nate believes they can locate a supply of the blood with the help of workings by writer John Ronald Reuel Tolkien, the future author of The Hobbit who would be serving in World War I at the time of his research. 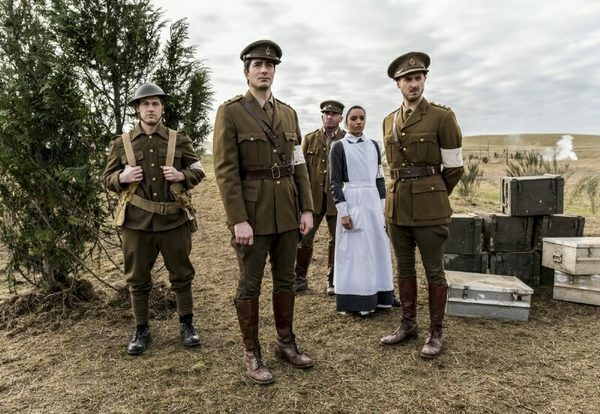 The team reclaims Tolkien, but after witnessing the war and another vision of Snart respectively, Amaya and Mick begin feeling tempted to use the Spear for their own purposes. Fortunately, the team locates Sir Gawain’s tomb where Tolkien believes the blood of Christ to be. Meanwhile, after being outdone by the Legends, the Legion plan to even their odds. At the tomb, Darhk and Snart confront the Legends, revealing Snart to have been brought back from the past and revealed the Legends’ secrets from his relationship with Mick. With Tolkien’s help, the team uses the Spear to locate Christ’s blood in the middle of the WWI battlefield after Rip successfully calls the battle to a brief truce. However, when about to destroy the Spear, Mick instead turns the Spear over to Snart and the Legion, leaving with them as Thawne speeds the group. Though Amaya is tempted to leave for the Spear, she remains with her team, though she openly disagrees with Sara’s methods. The Legends escape but soon lose Christ’s blood when Nate drops the vial. Without the blood, the Legends are helpless as the Legion activate the Spear. J.R.R. Tolkien’s works The Lord of the Rings and The Hobbit are referenced. Snart returns despite his death in the season one finale. Chase continues to torture Oliver for killing his father and several others while waiting for him to confess a secret. 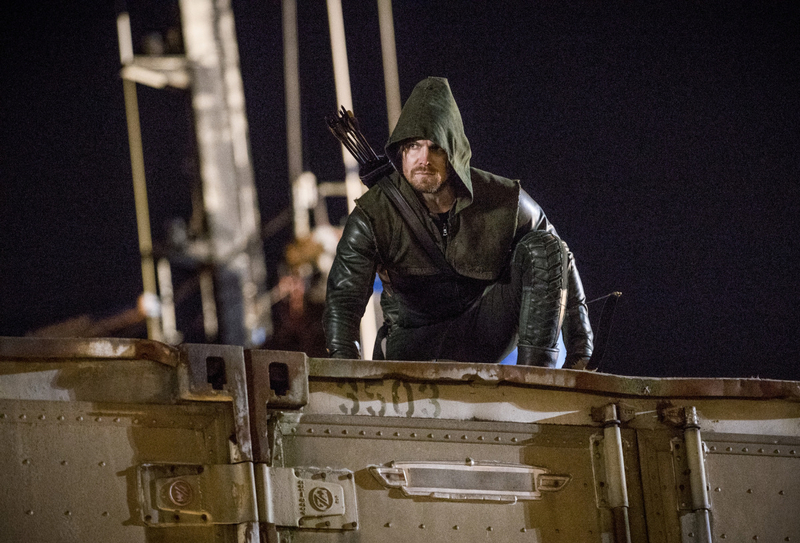 After reminding Oliver of all his victims, Chase then brings in a tortured Evelyn to force him to fight or have her be killed. Though she is willing to fight to survive, Oliver refuses to fight her despite her betrayal, leading Chase to snap her neck in front of him. In Russia five years ago, Anatoli becomes leader of the Bratva which gives him access to Kovar and his plans. From a meeting, he discovers that Kovar is partnering with Malcolm Merlyn to help overthrow the Russian government and take control. Oliver uses this information to interrupt a trade of sarin gas by killing several of Kovar’s men and later torturing some for information, though Anatoli warns against his methods. To move closer, he works with Taiana’s mother to enter Kovar’s building, though her act leads to her being tortured by Kovar’s men. Unfortunately, Kovar plans to trick and kill several members of the Bratva by poisoning them and framing the crime on the group in his building, setting off the sarin gas inside a casino. Oliver then fights Kovar and, against Anatoli’s advice, stabs Kovar in the chest. Though Oliver gains a tattoo for his work in the Bratva, Anatoli warns him of the man he may become. However, as Merlyn later looks over Kovar’s body, he soon discovers Kovar to be alive. Oliver finally confesses to Chase that he secretly enjoyed killing all his victims. After divulging this information, Chase reveals Evelyn to be alive and lets Oliver go after burning his Bratva tattoo. 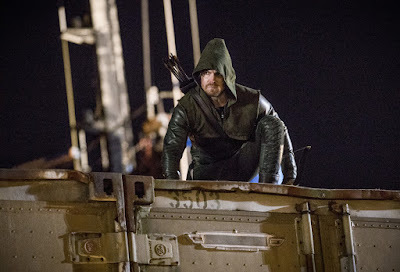 Oliver then returns to the base and officially ends his role as the Green Arrow by dumping his quiver. The title “Kapiushon” translates to Hood in Russian.